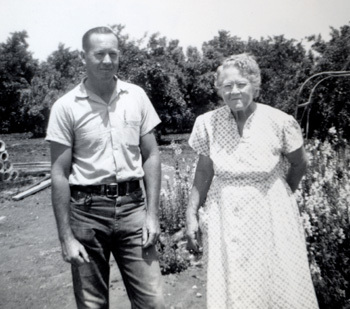 My father's nursery career began as a way to fulfill his mother's dream of having citrus trees on the farm. He knew nothing about growing citrus, so he sought out information from Carl Opitz, the Tulare County Ag Advisor. Carl was instrumental in teaching my father the fundamentals of growing citrus nursery stock. As his first nursery began to mature, a local grower offered to purchase the trees. At the time cash was hard to come by, so my father sold the first trees that he grew. Thus began his career in the citrus nursery business. 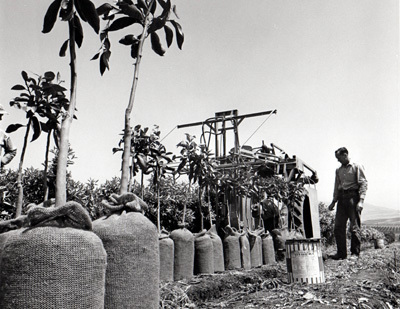 For the next 20 years my father grew citrus trees for a living, and during this time purchased additional land for the expanding nursery as well as for his farming operation. It was during these years he also began experimenting with new citrus varieties. He quickly became friends with two researchers at the University of California Riverside, Dr. Robert Soost and Dr. James Cameron. They were responsible for developing many specialty varieties as well as cleaning up and distributing older varieties of citrus. My father's commercial nursery grew trees in ground and utilized crews to dig the trees when ready for planting. In the late 1950s he purchased what was the first balling machine in California from the Jiffy Balling Machine Company in Long Lake, Minnesota. After retiring from the nursery business in 197?, my father continued to grow trees for his personal use. He continued to be a member or the Citrus Nursery Society and never stopped experimenting with new citrus varieties. In 1989 he decided to try his hand at container grown citrus. A new greenhouse was built that could hold over 1000 trees in sleeves. This proved to be a good move as California was hit with a devastating freeze in 1990 that would have destroyed the nursery had it not been in an enclosed greenhouse. Asecond greehouse was built in the mid-90's, and was used for over a decade. In 2008 that greenhouse was removed to make room for a larger, more durable structure. Our new greenhouse and hothouse were purchased from OBC Northwest, Inc. and are much stronger structurally than our homemade tunnels and should last for a very long time. We have now made the switch from plastic sleeves, which were difficult to fill and handle, to rigid tree pots provided by Steuwe & Sons. The new pots can be used several times and are easier to fill and place in the greenhouse. We are also using seedling pots in the hothouse, which will make handling and planting seedlings easier.